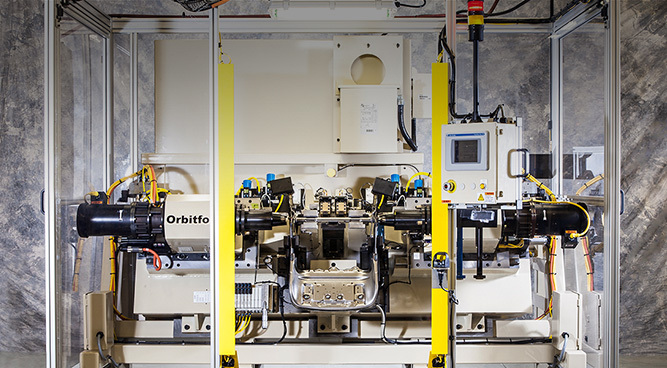 A 2-position rotary transfer machine (RTM)/dial table allows an operator to unload completed assemblies and load components to fixture tooling while the previously loaded components are processed. The fixtures are a quick change to facilitate other hinge styles. A set of overhead vision sensors will detect the presence of components prior to the dial indexing. The orbital riveter is mounted to a servo controlled cross slide and also has a pneumatic motion for bushing flaring. Seat Frame assemblies have forming and riveting processes that are required prior to final assembly. The sub-assemblies are placed in position and each frame tube is formed with an Orbital riveter with a toggle lock back up device. The depth of the forming is controlled through sensing in the riveter. The second side of the tube is formed in a similar manner. After tube forming, the frame is manually transferred to the adjacent riveting station where a similar operation of riveting with toggle backup is completed.